My wife comes from a long line of exemplary cooks. She works the kitchen by instinct, mixing, matching, improvising. She’s economical, mindful of but not enslaved to kids’ eating schedules, and treats recipes as inspiration rather than prescription. When life gives her lemons she makes lemon meringue tart. This is no way describes my approach to cooking. For one, I have no sense of proportion or timing. 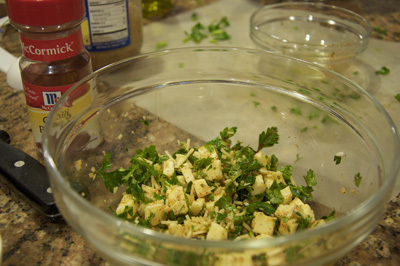 When I get it in my head that I am going to cook I can rarely tolerate not cooking — from scratch — every last damn thing. Call it a sense of cheating. If it can be made rather than poured from a can, I want to make it. It’s such a problem that there’s even a mild irritation that I can’t actually provision the milk or beef or rare vegetables from my backyard. Which of course means that dinner is rarely served before 10 PM on the nights I cook. Normally this little mania takes the form of Italian cooking, specifically Southern Italian, usually from the region of Basilicata. Lots of reasons for this, mostly having to do with family heritage (copiously covered previously). Last week, we made ravioli, with a twist. The particular recipe comes from my great-grandparents’ hometown of Barile, a village long-steeped in Albanian tradition. 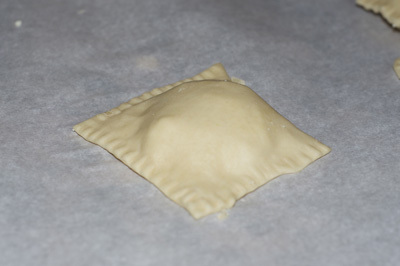 Ravioli alla albanese has been described as “dessert and dinner all in one” because the ricotta filling, called gyuz, is sweetened with sugar and cinnamon. Full ingredients and recipe. The ricotta was fun and surprisingly easy. 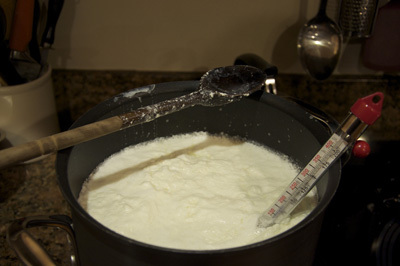 One gallon of whole milk plus one quart of buttermilk, heated to 175° until the curds start to separate. 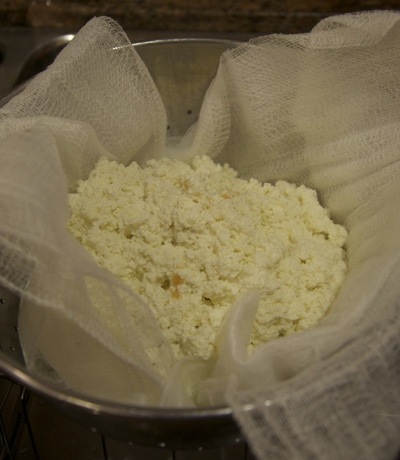 You then ladle the curds into cheesecloth and drain. Add your chosen seasoning and the fluffy warm filling is ready to go. Hand-making ravioli, on the other hand, was an extraordinarily laborious undertaking. We’d made pasta from scratch before — with an electric machine — but that won’t do for the sheets that form the ravioli pillows. 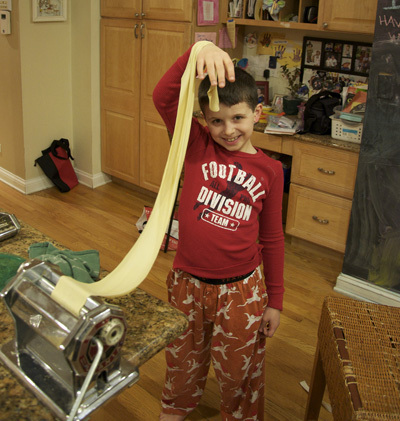 So we borrowed a friend’s hand-crank pasta machine. Problem was, it had no clamp to secure it to the counter which, if you’ve ever tried forcing dough through a tiny metal slit, was no fun at all. Well, that’s not entirely true. Getting it right was immensely satisfying. Once you have the sheets you use this fabulous little slicing/pinching wheel specifically for ravioli. This gives you the pillow “casing” into which you put the ricotta. You have to make sure the edge seals firmly as you will shortly be plopping the ravioli in boiling water and don’t want filling exploding everywhere. The recipe calls for meatballs and tomato sauce as accompaniment and here is where the from-scratch obsession shows its ugly underside. These sides ended up being two separate meals entirely. 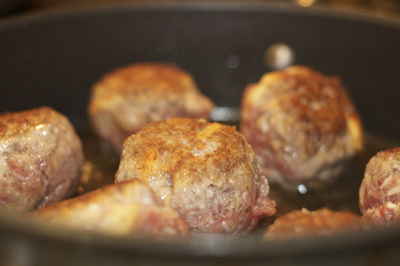 For one, the fist-sized meatballs came from a Neapolitan recipe that includes grated Parmesan, garlic, basil, oregano, and nutmeg (vetoed by wife). The sauce, however, wasn’t really a sauce but a ragù, basically an entire meal in a pot. 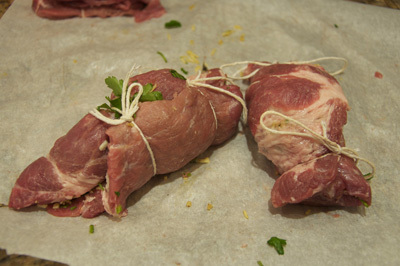 You pound pork shoulder flat, line it with pancetta, then fill it with a yummy payload of garlic, parsley, chili powder (hallmark of this region), nutmeg (vetoed), and pecorino or parmesan. Add white wine and canned whole tomatoes and simmer forever. In a nutshell what you get after simmering this pork bomb is a sauce for pasta and a second meal, which we didn’t not even attempt to eat on the night in question. All in all, a fantastic experience, though perhaps not one best-suited for a weeknight. Let me know if you’d like detail on the ingredients or process. See also Spaghetti All’assassino and Lucanian risotto.